The Boy Who Made Dragonfly, edited manuscript. This is the second draft and the first manuscript edited by both the publisher and Hillerman. It was typed on a typewriter and was heavily edited. 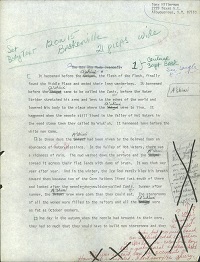 The chapter designations were added in mid-paragraph, suggesting that the chapters were natural breaks in the book, rather than preset chapters.